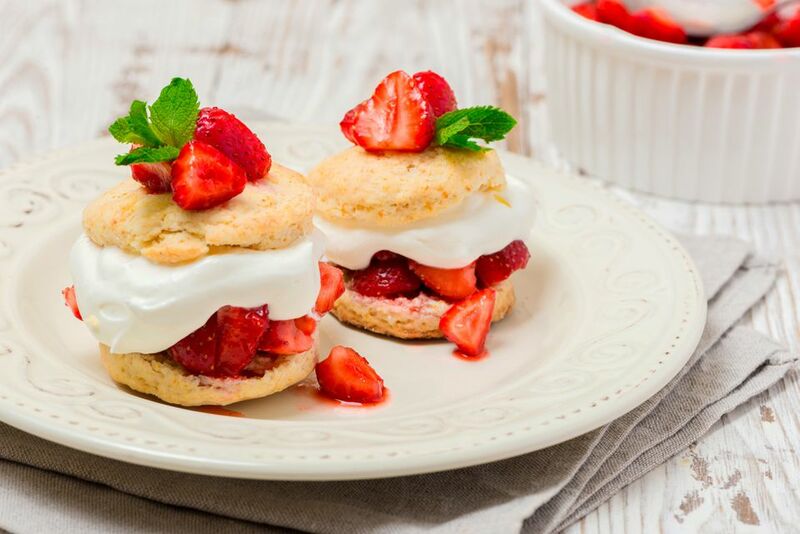 Nothing says spring like strawberry shortcake piled high on split biscuits with fresh whipped cream and sliced strawberries. This old-fashioned strawberry shortcake is a delicious spring or summer dessert to make for a weekend treat or special occasion. Strawberry shortcake is a summer tradition for many families. This recipe is for individual shortcakes and calls for 3-inch biscuits. You may cut the biscuits with a smaller cutter for smaller portions and more servings. Rinse the strawberries under cold water; drain well. Hull and slice the berries and place them in a bowl. Sprinkle with the 1/3 cup of sugar; cover and let stand at room temperature for about 1 hour. In another bowl, beat the whipping cream until foamy. Add 2 to 3 tablespoons of powdered sugar, as desired, and continue beating until the cream holds soft peaks. Cover and refrigerate until serving time. Preheat the oven to 425 F. Set the rack in the center of the oven. Line a baking sheet with parchment paper or buttered foil. In a food processor or bowl combine the flour, baking powder, salt, and 3 tablespoons of sugar. Blend well. Slice the butter into about 8 pieces and add to the mixture. Pulse in the food processor or blend with a pastry cutter or fingertips until the mixture resembles coarse meal. It should still have a few pea-sized chunks of butter left in the mixture. Transfer the mixture to a large bowl and make a well in the center. With a fork stir in the milk or half-and-half just until the dough is moist. Be very careful not to overwork. The dough doesn't have to hold together well at this point. Let the dough rest in the bowl for a minute. Gently pat the dough into a 6 by 12-inch rectangle about 3/4-inch thick and cut into 8 (3-inch) biscuits with a floured round cutter. Or make smaller (2 or 2 1/2-inch) biscuits if you would like a few more servings. For flaky, soft biscuits, work the dough as little as possible. Arrange the biscuits on the prepared baking sheet. Brush the biscuits with some milk or cream and sprinkle tops with some sugar, if desired. Bake the biscuits in the preheated oven for 10 to 15 minutes, until risen and golden brown. Remove the hot biscuits to a platter and split each horizontally with a serrated knife. Butter the cut sides of the hot biscuits and then top with about 1/3 cup of berry mixture and some of the chilled whipped cream. Replace the tops and top with a tablespoon or so of berries and more whipped cream. Garnish with more strawberry slices and mint leaves, if desired.